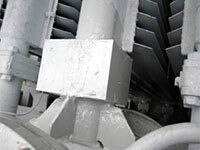 The oil immersed equipments such as transformers has been installed in the power plant and the substation. 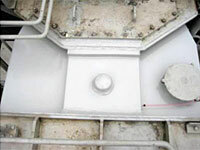 The deterioration of the gaskets or the rust of the iron plate occurs because of its period of use and ambient environment and the oil leakage is generated from its various parts. 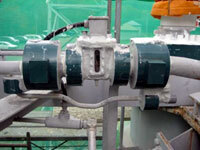 The leakage oil might cause the operating trouble of the equipment and the environmental pollution, and prompt repair is necessary. 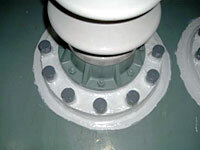 We are manufacturing adhesive"FLESEAL" for the sealing that stops the oil leakage, and are selling it. 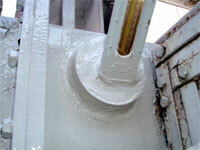 Original "Cover industrial method" is made good use of, and the repair of a lot of oil leakages is experienced. 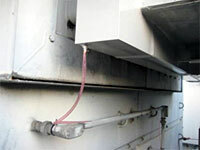 Please request the repair from us when oil leaks. 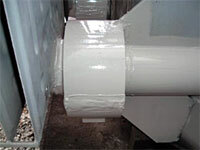 We are manufacturing selling adhesive "FLESEAL". 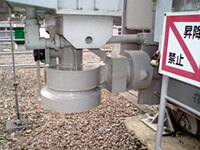 When oil in the equipment leaks, it is used. 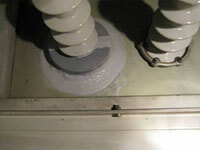 It is an adhesive of which the principal ingredient is the special transformation liquid epoxy resin. 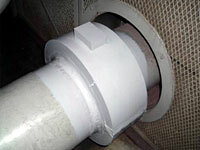 Merit of "FLESEAL (our brand name) "
- It has flexibility. And, it is strong compared with the impact. 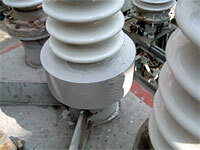 Therefore, it is suitable for use to the equipment such as the vibrating transformers. 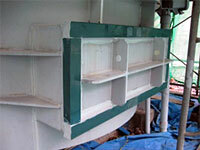 - Bonding such as the metal and others, the glass, and pottery is excellent because of special addition. - The drip can be few, and it spread it on the vertical. 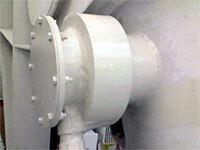 - It excels in the resistance to oil, chemical resistance, and the resistance to water. - It is excellent in weather resistance. And, it is possible to use it by exposing it in outdoor. 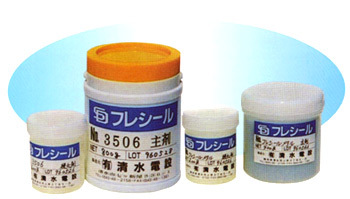 Kind and usage of "FLESEAL"
We are producing various sealing medicines"FLESEAL" according to the usage. 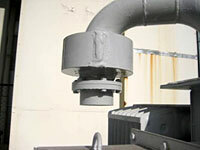 Metal For leakage oil stop of the first It hardens early. 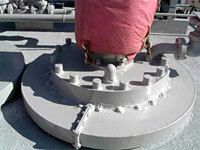 And, it is suitable for use in a wet place in oil. 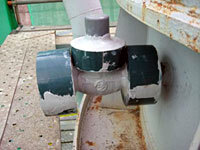 No.3506 For leakage oil stop secondarily For corrosion part painting Because the hardness time is longer than "flesealmetal", the handling of it is easy. 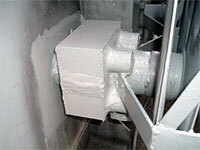 And, it is suitable for protection and final coating. 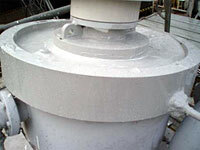 No.4500 For pouring For filling For corrosion part painting Because it is an adhesive of the low viscosity type, it is suitable for the pouring work and the painting operation. 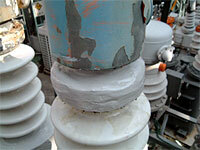 We have been going specializing in the leakage oil stop such as transformers. The sealing medicine "FLESEAL" is used for it. 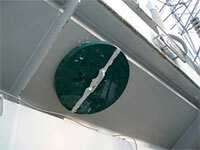 And our original " Repair by plastic cover" is the best to stop oil leakage. 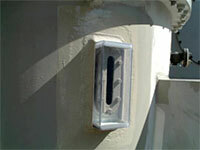 - It is possible to work without pulling out the oil of the equipment. And, working hours can be shortened. - It is possible without stopping working of the equipment when there is no worry of the electric shock near the work place. 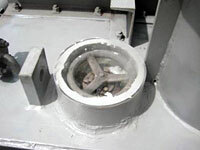 - The price can be decreased compared with the gasket exchange work. 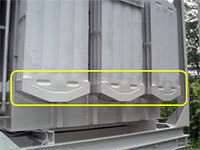 - The effect of stopping the leakage oil is large because the whole of the trouble location is covered with a plastic cover. 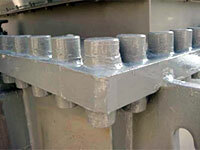 - Working hours can be greatly shortened because prior work of bonding is facilitated. - It becomes possible to strengthen the leakage oil stop performance in addition by filling the low viscosity adhesive in the plastic cover. The table below shows characteristics and the performance of "Flesealmetal" and "Fleseal No.3506". Copyright (C) 2017 shimizu_inc All Rights Reserved.